At just 150km from Thailand’s capital city Bangkok, Pattaya is a popular destination for those who want to see some of Thailand’s coastal delights while still enjoying all the trappings of a big city. Although the beaches may not be as famous as Maya Bay, they’re still beautiful and have a lot more going on in terms of activities compared to some beaches in the south of the country. 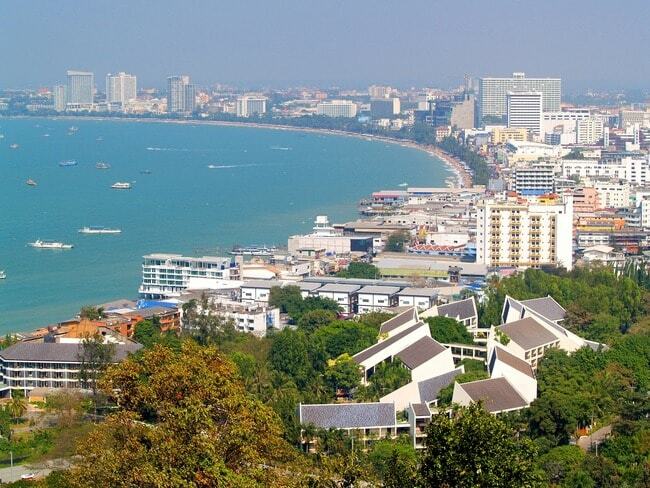 Here are the beaches you should check out on your travels through Pattaya. There’s no better place to start than the most popular and most lively beach in the city – Pattaya beach. At four kilometers long, this crescent-shaped beach has plenty of space for visitors and it needs it too, with plenty of people descending upon it to take advantage of the blazing sun and warm weather. There’s more than sunbathing on offer though. Parasailing, jet skiing and the classic banana boat are all available for you to enjoy, as well as beachside shacks that can prepare your favourite Thai dish should you get peckish. It’s also home to some great parties at night, if that’s your cup of tea. Just two kilometers away from Pattaya beach lays Jomtien beach. Home to a quieter crowd, this palm tree lined beach is perfect if you’re all partied out and want a more subdued atmosphere. It’s not completely lifeless however as bars and restaurants are on hand nearby, and it’s a real hotspot for windsurfing and kiteboarding, which you can take part in if you wish. If not, there’s golden sand to relax on and tropical water to take a dip in as you watch the world go by. Naklua Beach is a slice of ‘real’ Thailand in a city that often looks anything but. The beach is shared with the local fisherman, who you can see throughout the day plying their trade in the water or on the dock, and the horizon is dotted with the sight of fishing traps. There’s a sandy beach to enjoy, and less in terms of watersports activities, meaning it’s a great place to go for a swim and enjoy the more rustic scenery from the water. Not too far from Naklua beach is Wong Amat beach, which is very much in a similar, chilled-out vein to Naklua. Despite its proximity to Pattaya beach too, it’s much quieter and much more secluded, meaning there’s a good chance it will be cleaner too. It’s a great choice for those who want to relax, away from parties and noisy water-based activities, and so should definitely be checked out for those wanting to get away from it all for a while in Pattaya. Koh Larn, or Coral Island, has much more in common with the famous southern Thailand beaches than with other beaches in Pattaya. It’s a little slice of paradise nestled away from a city which can at times feel like anything but. Perfect for a romantic getaway, the coral from which its name derives can be enjoyed through snorkeling or taking a glass bottom boat, and the clean, transparent water surrounding the beach should make for good visibility. 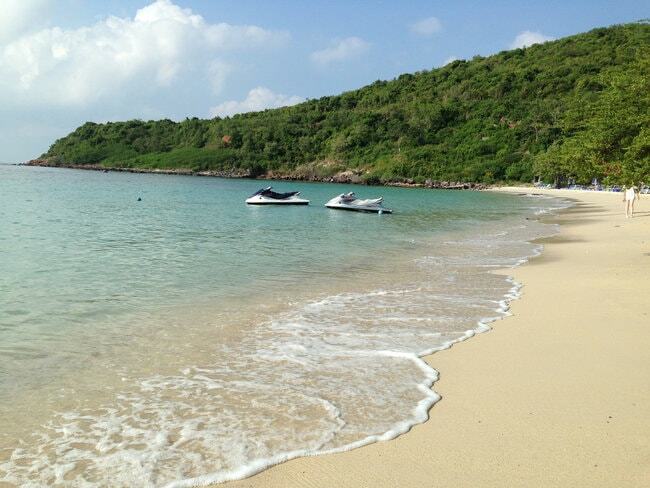 At 1.5km long, this quiet beach has plenty of space for those visiting to relax and sunbathe. Quiet on mornings, this tree-backed beach can soon get a little livelier once the watersports begin to get going but it’s still peaceful enough and much quieter than Pattaya or Jomtien beach. There’s also a special section of the beach for LGBTQ+ members to enjoy, and plenty of massage places for you to de-stress and get pampered in. 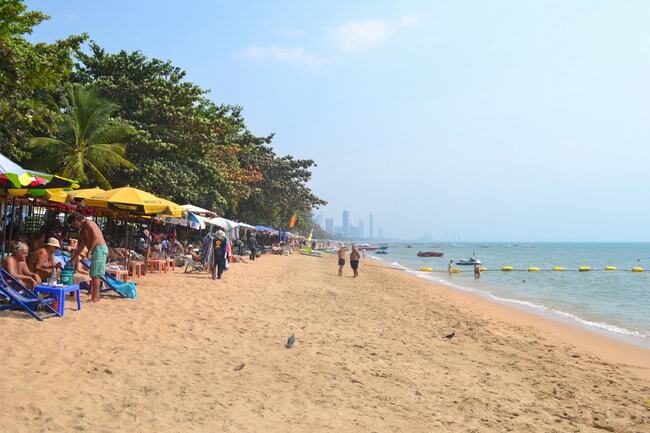 Located near a pleasantly quaint Thai town, this sandy beach has a local feel with fishing piers nearby and a lack of some of the more lively aspects of the other beaches in Pattaya. The beach is great for divers; whale sharks often visit the area, and there’s the remnants of a cargo ship that was sunk in WWII resting beneath the waves just waiting to be explored by divers.